Did you know that it is possible to generate fully-functional QR codes in Microsoft Word using mail merge without the need for third-party plugins? 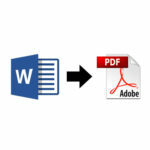 Use this handy PowerShell script to convert all Microsoft Word DOCX files in a directory into Adobe Acrobat PDF files. If a required font is missing, this script will alert a user that the font needs to be installed on their local computer before a Microsoft Word file will display properly. Use this simple Visual Basic for Applications (VBA) script to reformat any text string within Microsoft Word. Microsoft Word will format dates as mm/dd/yyyy as the default in mail merge documents. The field codes can be changed to enable dates in any format.